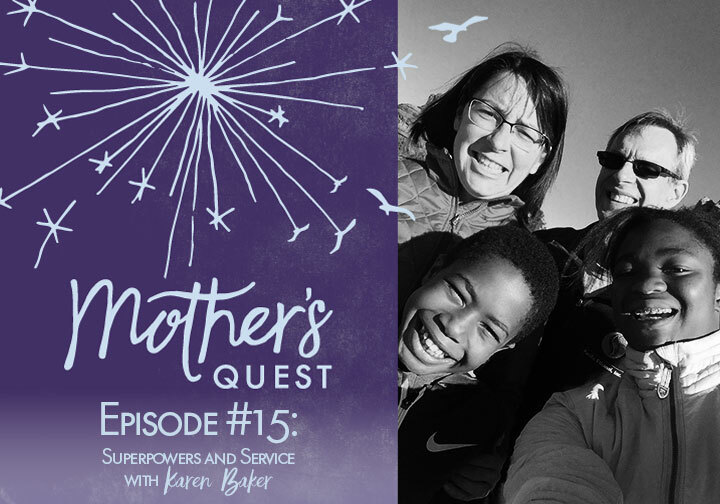 I’m excited to share this Episode #15 with you– a conversation with Karen Baker, a mentor of mine who played a pivotal role in connecting me to a career of service. It’s not surprising because connecting people to service is Karen’s super power. Karen has been making matches her whole life, but she currently brings this gift to her role as the Chief Service Officer of CaliforniaVolunteers, where she serves under Governor Brown. Karen has 20 years of innovative leadership in all facets of the service and volunteering sector, including local and national non-profits and federal agencies. In 2008, she was appointed by Former California Governor Schwarzenegger to serve as the first-in-the-nation state cabinet Secretary of Service and Volunteering. Karen is also an amazing mom to 2 children, Ella and Christopher, both adopted at birth by Karen and her husband. In our conversation, we talk about the ways in which Karen’s parents and seven siblings inspired her to be of service to others, how she brings that service to her work at CaliforniaVolunteers, and how she has learned to put needs out there and watch as a community rises up to meet them, most recently experienced as Karen led efforts to respond to the Oroville Dam disaster. 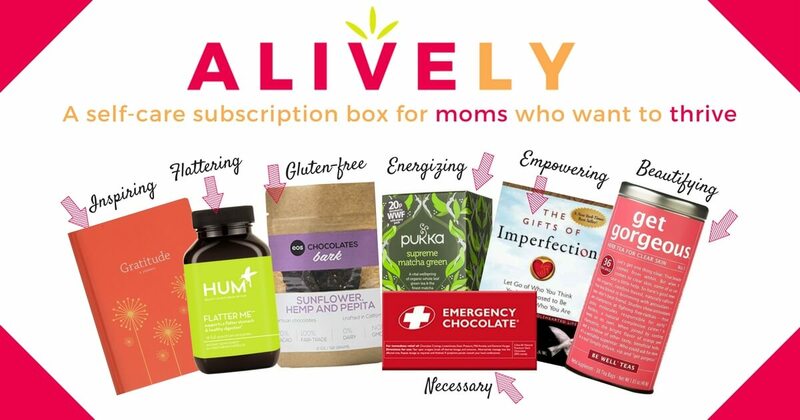 We also talk about her experience parenting children with ADHD and Oppositional Defiant Disorder, how she using a morning playlist and thoughtful nighttime ritual in between the “madness in the middle,” to ground herself and her children, and how she is learning to take time and find new ways to invest in herself and her relationships. It was a total joy for me to reconnect with my mentor Karen and I left the conversation so appreciative of the work she does in my state of California, reminded of the importance of using our superpowers to benefit others, and inspired to engage my own children in service. I hope you too find this conversation an inspiration to uncover and channel your family’s superpowers to create a service legacy. Heart of Los Angeles Youth, the incredible organization that Karen connected me to that set me on my career path after college. CaliforniaVolunteers – addresses state and community challenges by investing in high impact service solutions, while leveraging public, private, and nonprofit partnerships and resources. E.P.I.C. Life Planning and Reflection Sheets to help you start recording weekly intentions and daily gratitude. 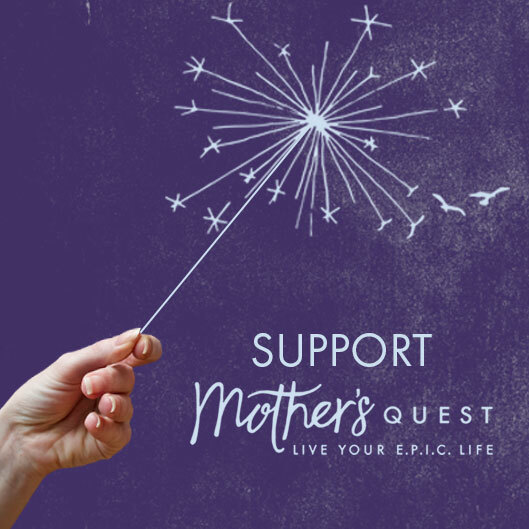 If you haven’t yet visited the website, I want to invite you to head over to mothersquest.com to explore some of the ways you can get more connected. At the site, you can sign up for our email list to have show notes delivered to your inbox, click the link to join the Facebook group and press record to leave a voice message for me. I would love to hear which are your favorite moments from the podcast and how what you are hearing and learning is impacting your E.P.I.C. life. I plan to highlight those moments from the different episodes, and your voices, in the season finale coming in early April. So do head over to mothersquest.com and use the voice message tool to help me create an amazing season finale. 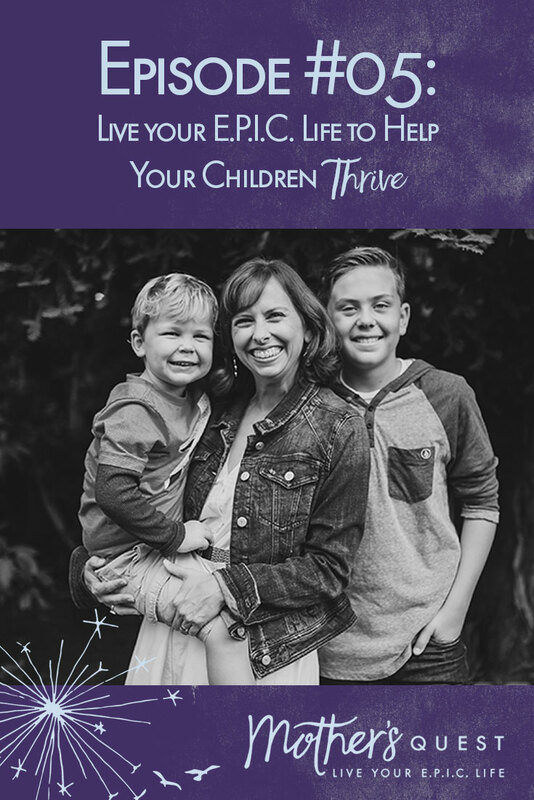 Finally, I invite you to schedule a free 15 minute planning session where I can help you bring more intention to your life using the Live Your E.P.I.C. 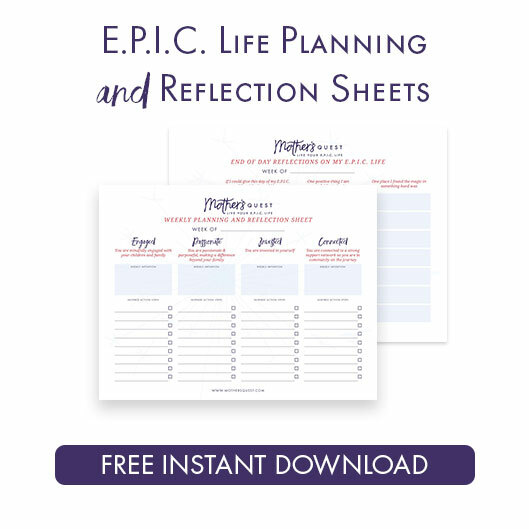 Life Planning and Reflection Sheets which you can download for FREE at www.mothersquest.com/reflectionsheets. Want to join the patrons above and help support more meaningful conversations such as these? Visit the Mother’s Quest Patreon Page to become a regular patron or visit this link www.mothersquest.com/be-a-supporter to make a one-time donation.